The Nike PG 3 X NASA is inspired by NBA All-Star Paul George's hometown, Palmdale, Calif., and its connection to NASA. A professional basketball player's personal connection to NASA has given rise to a new pair of sneakers. The Nike PG 3 X NASA shoes draw their design cues from the birthplace shared by five-time NBA All-Star Paul George and NASA's historic space shuttle fleet. Born in 1990, George "landed" in Palmdale one year before the rollout of NASA's fifth and last space shuttle orbiter, Endeavour, from the Plant 42 assembly facility located at the center of northern Los Angeles County. According to Nike, the PG 3 X NASA were directly inspired by the Armstrong Flight Research Center Building 703, a large aircraft hangar located adjacent to Plant 42. Oklahoma City Thunder small forward Paul George debuted his PG 3 X NASA sneakers on the court on Jan. 10, 2019. "Embracing the spirit of exploration, PG [Paul George] has rocketed from a small town to the top of the league by pushing beyond the pinnacle of his game," Nike described on its website. The PG 3 X NASA "honors his mission to one day leave his footprints on the moon." George, who plays for the Oklahoma City Thunder, debuted the new sneakers on the court during the team's Jan. 10 game against the San Antonio Spurs. "With my line and space being involved, it goes and ties back to my hometown," said George in a video about the new shoes. "Just thinking outside the box, always going exploring and expanding, I think this collaboration gets both that." The orange mesh, metallic silver and blue and red overlay sneakers incorporate "93552," the postal code for Palmdale, on their midsole. The heel is also inscribed with a quote that George says sums up his vision for the future: "Don't tell me the sky's the limit when there are footprints on the moon." NASA Armstrong Flight Research Center Building 703 in Palmdale, California inspired the Nike PG 3 X NASA sneakers. "I always wanted to be in the NBA. That's the sky. Now, me being an All-Star, me working to become a champion — that's the footprints on the moon," said George. The NASA logo appears twice on the sneakers, printed on the insole and affixed as a patch on one of the heels. The other heel has an Apollo mission patch. The shoes also feature a "Remove Before Flight" tag. Nike designers spent months improving the shoe's traction, comfort, lockdown and lightness. The circular traction on the outsole was inspired by moon craters — a pattern built using algorithms from various analyses of George's movement on the court. "NASA inspires us in how they use minimal resources to create things that will survive in extreme environments," said Nike basketball footwear designer Tony Hardman. "We've done the same with the PG 3, making it lightweight with multi-directional support." Initially, the space theme was only a loose idea, but NASA's involvement opened up more possibilities, said Hardman. "We started off talking about some of this space inspiration, but hadn't really grasped the idea of going all the way with a true collaboration with NASA. When the team really went out and made that happen, it was amazing and we really felt we could up the ante with the collaboration piece," he said. The Nike PG 3 X NASA sneaker features NASA's logo, a moon crater-inspired traction and a "Remove Before Flight" tag. "It is an amazing opportunity. Anytime you can work with Nike and a group like NASA and create a collaboration like this, it is an honor to be part of it," explained Hardman. 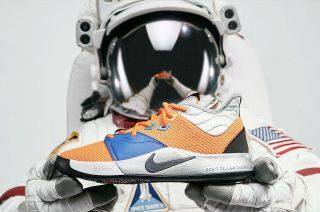 In addition to the sneakers, Nike has designed a line of apparel and accessories that continue the NASA theme. The garments also feature the NASA logo, Apollo mission patches and the Palmdale zip code. The Nike PG 3 X NASA 'Total Orange' shoes launch for sale on Nike's SNKRS website on Saturday, Jan. 26 at 10 a.m. EST (1500 GMT) for $120 per pair. See more photos and video of the Nike PG 3 X NASA sneakers and apparel line at collectSPACE.